In an op-ed published in today’s Virginian-Pilot, Art Collins, the former executive director of the Hampton Roads Planning District Commission and Metropolitan Planning Organization, eviscerates the deal. The rest of the commonwealth gets its operations and maintenance paid out of the state transportation accounts. 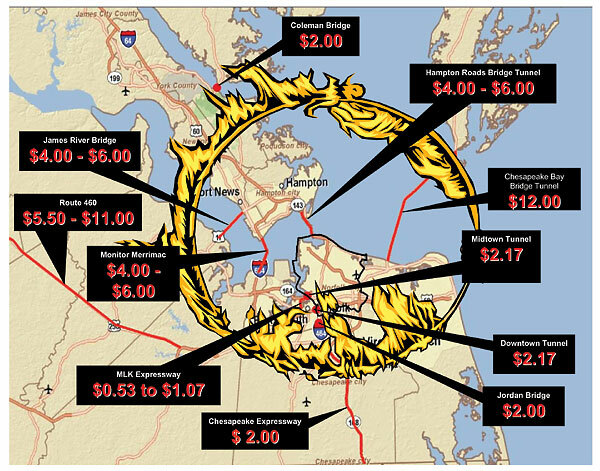 So Hampton Roads drivers will pay to maintain facilities in our region as well as the rest of the state through the existing gas tax and other fees. If the state is going to mandate a toll, which is a tax, without a referendum, why not mandate a sales tax and fix all our major transportation deficiencies? I think I can answer that one: tolls aren’t taxes, Mr. Collins, at least not in the language of the legislature. That’s why they gave us the referendum. We are allowed – if approved – to raise taxes on ourselves, but Richmond can’t do that. UPDATE: At the time of writing, the article had not been posted online. You can now find it here. Maybe when the people are tired of tolls they will wise up and take an interest in what the Va. Leg. is doing with revenue for roads and sit. in Northern Va. Maybe. Richmond can’t raise taxes on us? Or just sales taxes? I wish we had the Hampton Roads Transportation Authority as an option, but the current Govenor mismanaged that process, I believe. Designing an organization while he was Atty General that was deemed unconstitutional. Or I wish, as Collins points out, we had managed to have the sales tax referendum approved by the voters. Roads in Hampton Roads are almost as good as a third world country’s. It is embarassing that our legislators refuse to do the jobs we hire them to do. And now we are stuck with an awful project as was contracted yesterday.